In China, Phytophthora rubi, P. fragariae and P. × cambivora are quarantine organisms affecting berries for which rapid, specific and high-throughput methods are required for their simultaneous molecular detection. In this study, universal primers 18SUF/18SUR for the tested 13 Phytophthora species based on 18S rRNA sequences, specific primers PRSF/PRSR and PFSF/PFSR respectively for P. rubi and P. fragariae based on nad9 gene sequences, and specific primers PCSF/PCSR for P. × cambivora based on Ypt1 gene sequences were designed. The specificity of primers was demonstrated using 17 strains belonging to 13 Phytophthora species. A quadruplex PCR that specifically and simultaneously detects the three quarantine pathogens was developed. Application of this system detected an 884 bp universal band of 18S rRNA among all the Phytophthora species, a specific band of 556 bp and 615 bp to nad9 gene respectively in P. rubi and P. fragariae, and a 314 bp band specific to Ypt1 gene in P. × cambivora. Over conventional PCR, the sensitivity of the quadruplex PCR for P. fragariae was unchanged and lowered for P. rubi and P. × cambivora; but the specificity and throughput of the quadruplex PCR were all increased. This study represents the first molecular differentiation of P. rubi and P. fragariae, the two very similar Phytophthora species affecting berries. The quadruplex PCR developed can be applied for the rapid, specific and simultaneous detection in culture of the three quarantine Phytophthora species affecting berries and lays an excellent basis for further research to test it directly on plant materials and /or soil samples. 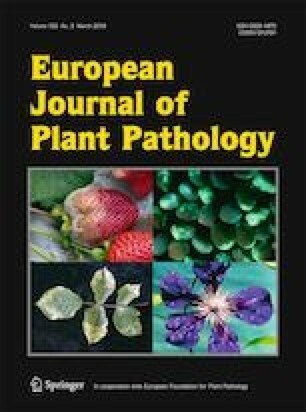 This work was funded by Rapid Identification of Quarantine Fungal Phytophthora Pathogens of Imported Fruits and Seedlings, a Programme from The General Administration of Quality Supervision, Inspection and Quarantine of PRC (2012IK286) and Plant Quarantine Pathogen Detection and Application by DNA Barcoding, National “the 12th Five-Year” Science and Technology Support Program (2012BAK11B02). This research did not involve any animal and/or human participants. The authors declare that they have no conflict of interests. EPPO (2018) EPPO Global Database (available online). https://gd.eppo.int/taxon/PHYTFR/hosts.